Click the button below to add the ReadyHarvest 6 Month (25 Year Shelf Life) Freeze-Dried Food Supply: 1-2 Person to your wish list. Welcome to our ready-made, just-add-hot or cold water, signature 6-Month package, specially selected to last 25-years on a shelf. No refrigeration needed - a true worry free food supply. 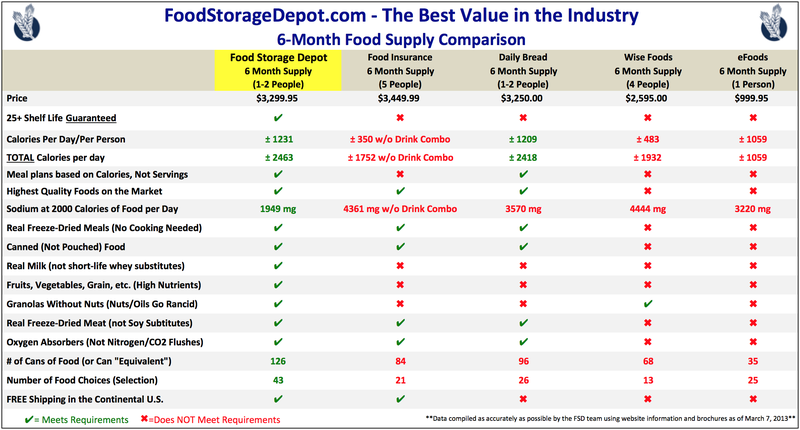 This 6-month package consists of mostly freeze foods and ensures that if you were to lose your job, experience economic difficulties, experience an emergency, or endure prolonged utility outages, you and your family would make it through easily, without the added stress of wondering what to eat next or how to prepare it. And, this food plan is made of the highest quality freeze-dried meals, quick prepare options, and food staples you would need to be secure for the long term.